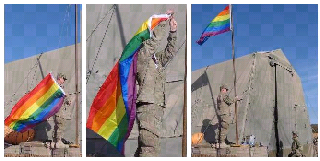 Nicole Jodice’s sweet, sweet boo raises a gay pride flag above a U.S. military base while stationed in Afghanistan. Not a hoax! Not a photoshop illusion. Nicole assures us this is the real deal, baby! A bottomless well of gratitude and admiration to not only the LGBT members of the military across the globe, but the incredible straight allies that literally wave the flag for equality wherever they go. We’re absolutely humbled and inspired by your support. Thank you! Equality doesn’t appear to go both ways however. Camp Marmal is a German base that hosts NATO forces. The interfaith chapel in question is supervised by the U.S. Army. The soldiers said they found great comfort in the chapel —and the cross visible outside. “Sometimes the Church and the ability to openly express religious views ultimately gets people through the deployments over here,” one told POLITICO by email. You can openly express sexual views in the army, but religious views are apparently too controversial. Now it’s Christians who have to live their lives in a closet.